Anyone who owns a home or business in Kendall, FL’s humid climate, realizes the damage that moisture can create. If left unchecked, moisture can cause mold, attract termites, and lead to mildew or fungus. It also can lead to breathing problems for those with asthma or other conditions. It can also lead to property damage, so moisture control is definitely an important way to protect your investment. Here are some common places where moisture can occur in your home or business. Moisture in attic areas of your home is often something that will go largely unnoticed. If you’re like the rest of us, the only time you visit your attic is when you are retrieving your Christmas decorations. Without proper moisture control, you just might have a nasty surprise waiting for you: mold! The problem can be exacerbated by the fact that many of us are simply not aware that moisture can also occur in our attics. So ask yourself this question: is the condensation on my roof the result of a roof that needs replacing or is it because of attic moisture? Moisture control is often focused on this part of your home. As moisture control experts, we can diagnose the problem and determine whether it is a leaky roof, a poor insulation job, or inadequate attic ventilation. When people think of moisture control, they often do not realize that their attic moisture could be the result of poor ventilation. Moisture control also encompasses moisture in your crawl space. In a lot of ways, this can be an even more serious problem, because it is often overlooked. Mold can often develop in a house's crawl spaces, and even if it is only appearing in spots in can be a serious problem. White mold is only surface mold, and while it indicates your home or business has a moisture problem, it can be an easier fix. 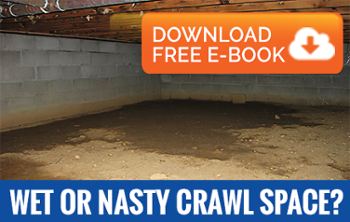 On the other hand, black mold in your crawl space can often lead to property damage. If you suspect any moisture control issues, we can inspect, provide a thorough mold removal and mold remediation process, and install a crawl space encapsulation with a dehumidifier, to prevent any further problems. Moisture in your basement is even more than just a nuisance. Standing water in your basement can ruin your carpeting, drywall, and the framing of your house. It can contribute to serious structural problems in your home and can ultimately impact the foundation as well. Not too many homes in the Kendall, FL, area have basements, but the ones that do are susceptible to water damage simply because of the heavy rainfall our state gets each year. There are several do-it-yourself fixes you can utilize to lessen the damage of moisture in basement, including airing out your basement, running a dehumidifier, or place waterproof coating on your walls. If you are encountering moisture problems in any of these areas, give us a call today for a professional inspection and estimate!